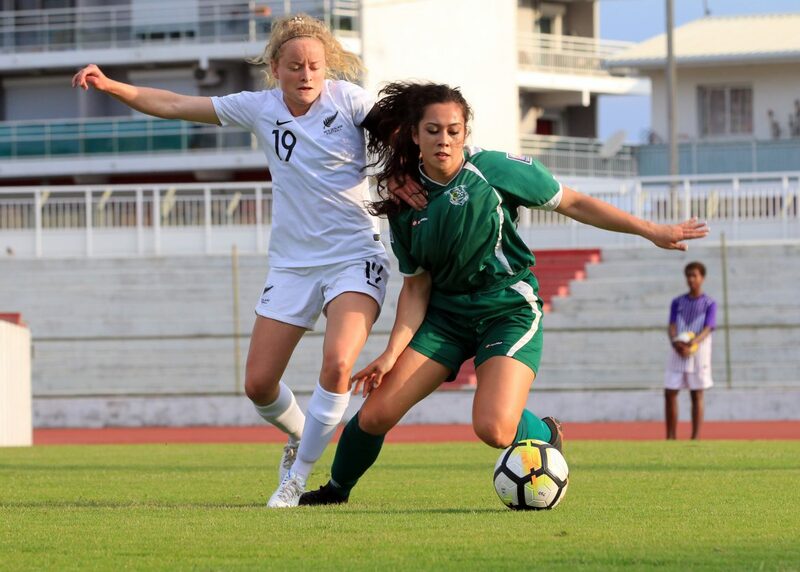 Fiji women’s football team have booked an historic first appearance in the OFC Women’s Nations Cup semi-finals in 20 years after an equally historic 12-0 win over Tonga. They’ll be joined in the semi-finals by New Zealand’s Football Ferns who beat Cook Islands 6-0 in the evening match at Stade Numa Daly. The Bula girls completely overwhelmed Tonga in a match which saw three players score hat-tricks. Luisa Tamanitoakula went on to add four goals to the tally after opening the scoring with an early sixth minute goal. Cema Nasau and Sofi Diyalowai were also in impressive form as they too scored three goals apiece. Preliminary stage top scorer Trina Davis contributed with a brace as she displayed another impressive performance. The win puts Fiji and New Zealand equal on six points after two wins but the Football Ferns sitting top with a superior goal difference. Fiji coach Marika Rodu said his team will now planning ahead of a semi-final encounter. “We will take the win but at the same time we need to come back down to earth and look ahead to a game which will most probably bw New Caledonia or Papua New Guinea,” he said. Rodu added that he has mixed feelingd after leading the Fijian women’s football side to a the semi-finals for the first time in 20 years. “It’s a bit mixed you want to celebrate but at the same time, the journey is not at it’s end yet. “We may have two more games that we really want to focus on, semi-final and final if you look at it. Tonga coach Christian Koaneti congratulated Fiji for a well-deserved win. “First of all credit to Marika and his girls because we came into the game to challenge Fiji,” the Tongan coach said. New Zealand managed to overcome a well-organised Cook Islands side 6-0 in Group B’s late evening clash. The Ferns coaching staff made a brave decision resting several of their starters and opting for a new look starting lineup. Despite a spirited defensive performance by the Cooks, the Football Ferns led 3-0 at the break. Experienced midfielder Annalie Longo opened the scoring before Emma Rolston scored her first two international goals for the senior squad in the first half. Cook Islands continued to show their fighting spirit in the second half as they created some great chances but lacked the finishing edge. Lee Maoate-Cox had an outstanding game for the Cook Islands with some creative moves throughout the game, an excellent defensive effort and even a few attempts on goal. New Zealand went on to score another three unanswered goals in the second half. Teenager Grace Jale scored her second senior international goal late in stoppage time having come on as a impact substitution, as did fellow substitute Sarah Morton while Katie Rood rounded out the list of goal scorers. New Zealand coach Tom Sermanni said he was satisfied with the win and gave credit to Cook Islands for a spirited performance. “It was good to get the win but I honestly thought Cook Islands put on a great display today,” Sermanni said. “I though they showed a real spirited, determined performance and made life very difficult for us. Tuka Tisam shared similar sentiments to his counterpart, giving credit to his team for a spirited performance against the defending champions. “It was really tough against New Zealand, that have a strong squad,” the Cook Islands coach said. “The girls did really well defending like who we planned and trained for. Tonga and Cook Islands will be playing for pride on Sunday while Fiji takes on New Zealand to define the final standings in Group B ahead of the semi-finals.